Spray 13x9-inch (3-quart) glass baking dish and 16x12-inch sheet of foil with nonstick cooking spray. Heat large nonstick skillet over medium-high heat until hot. Add chicken; cook 3 to 4 minutes or until chicken is no longer pink in center, stirring frequently. Remove from heat. Stir in soup, sour cream and chiles. Overnight casseroles are prepared with ingredients that improve with a little extra mingling time. 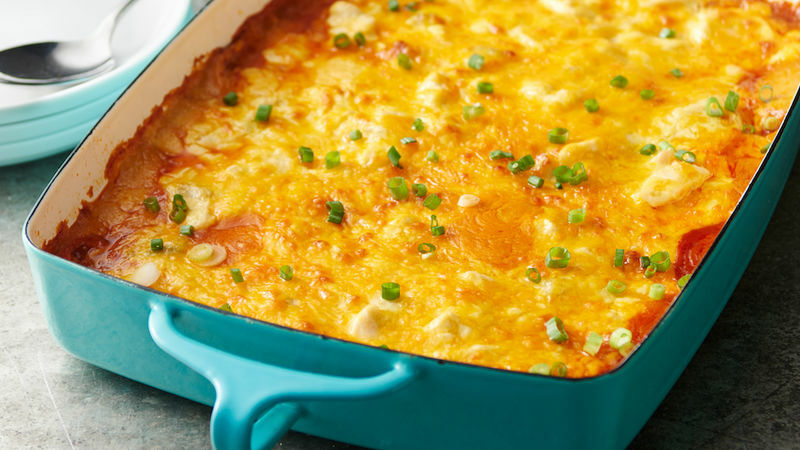 Don't be tempted to bake this casserole immediately; corn tortillas need time to absorb the enchilada sauce and soften. Serve this flavorful Mexican-style casserole with greens tossed with orange slices, diced avocado, jicama sticks and citrus vinaigrette. Serve fruit sherbet and sugar cookies for dessert.